Few things are better than a freshly baked loaf of bread slathered down with butter and some good jam. That’s true for crusty breads with fluffy interiors and the more hearty, dense breads that I also know and love from Europe. Here is a bread that is beloved throughout Germany and is also widely enjoyed in Austria and Switzerland. 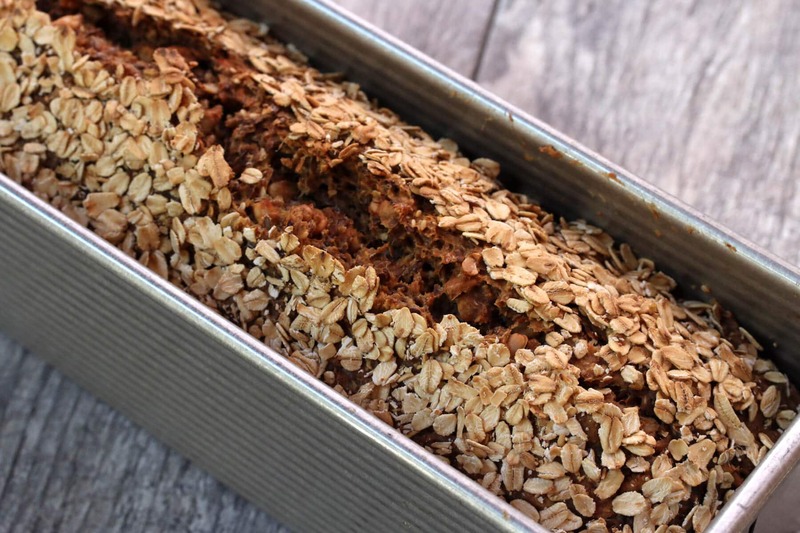 It features a grain called Einkorn that is used throughout much of western Europe, though you can substitute other grains as noted in the recipe. 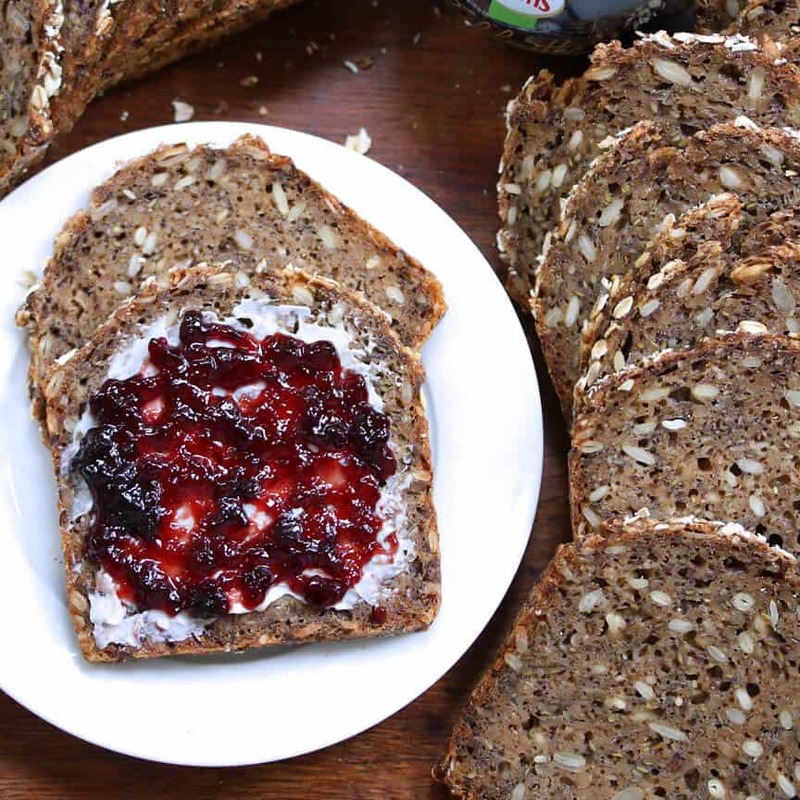 Dense, chewy, packed with nutrition and full of flavor, this German Vollkornbrot is wonderful with your choice of butter, jam, Nutella, cheese, or cold cuts. 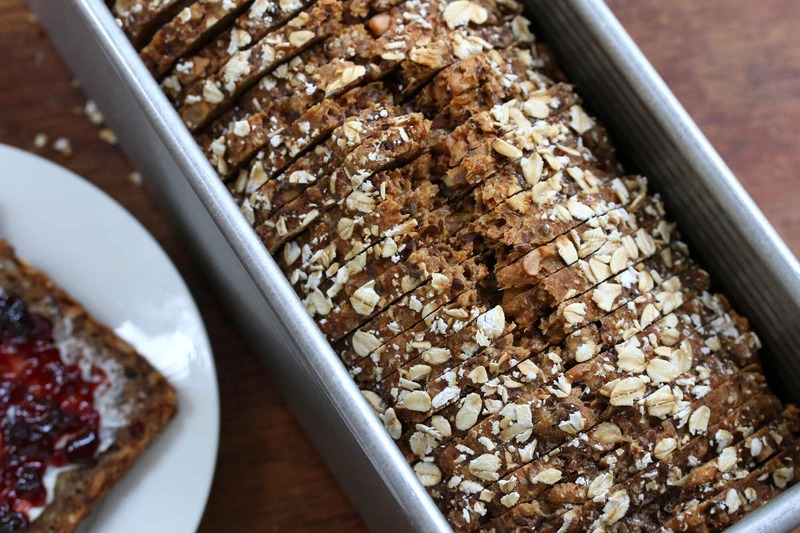 Have you heard of the grain einkorn before? Modern day wheat over the centuries has undergone a series of genetic changes for the purpose of increasing yield and gluten content. It almost unidentifiable to its ancestor (and my guess is that is why gluten issues are a more recent occurrence). Einkorn is the most ancient form of wheat on earth and hasn’t undergone these genetic changes. It is the purest form of wheat we have. You can purchase einkorn online HERE. The advantages of einkorn: Most agree it tastes better than wheat and is much easier to digest, even easier than spelt. Compared to the gluten in modern day wheat, it contains a structurally different composition of gluten that the body is able to digest more easily. In fact, many people with gluten free issues who have switched to einkorn have found that they’re able to tolerate and digest it with ease. Even visually there’s a difference between wheat and einkorn. Wheat (left) is nearly double the length of einkorn (right). Einkorn also has a deeper caramel color. It’s unfortunate that as wonderful as Einkorn is, and common as Einkorn is in many places throughout western Europe, it’s almost unheard of here and very few places sell it. And for that reason it’s also much more expensive here in the U.S.. Hopefully that will change as it becomes more common. The same was true of spelt for a long time and though it’s still far less common than wheat here in the U.S. its price-point has gone down. I buy all of my grains, including einkorn, in bulk. I take out what I need for a few weeks at a time and store the rest in a dark, cool place. It saves money that way and I have easy access to everything I need. And I LOVE being able to grind my own grains fresh as needed and make up my own fresh baking mixes! My German-made KoMo grain mill is the pride and joy of my kitchen. 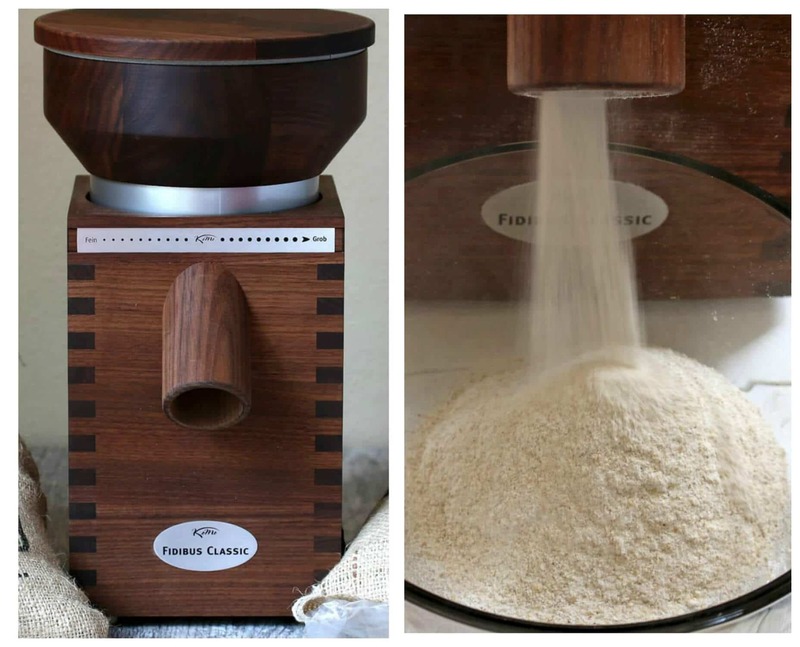 German engineering at it’s best, the KoMo grain mill is simply awesome. You can grind your grains as fine or as coarsely as you like. With a 12-year warranty this thing is a work-horse and does a magnificent job. I use it nearly every day grinding my own flours, making cornmeal and a variety of mixes. I cannot recommend it highly enough. 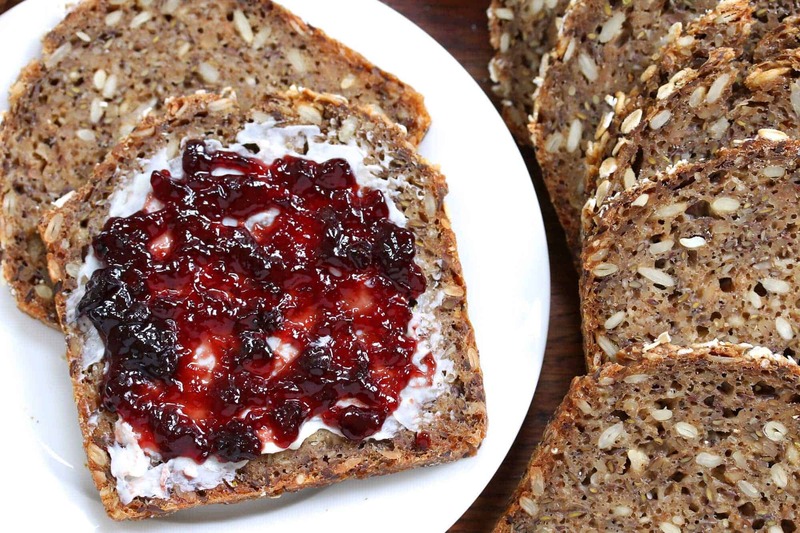 This traditional German bread uses a combination of whole einkorn berries and ground einkorn flour. 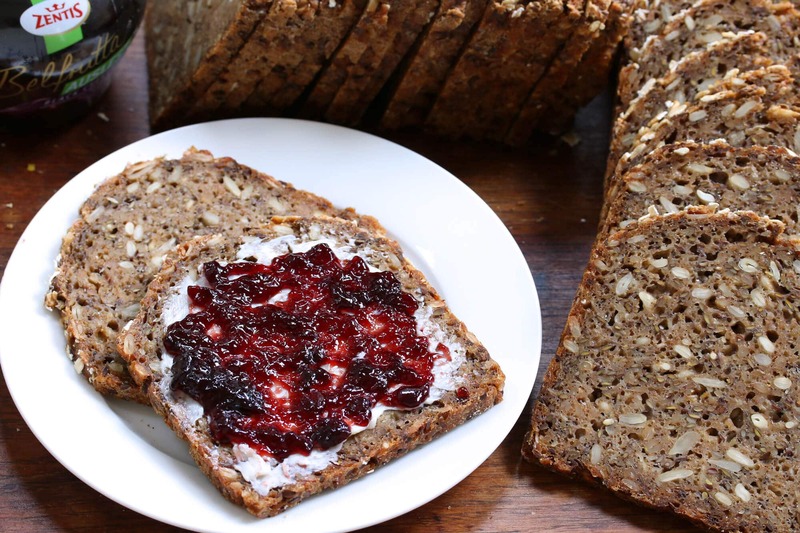 Whether you’re grinding your own grains or buying the flour already ground, you’re absolutely going to love the texture and flavor of this wonderful German Vollkornbrot! Dissolve the yeast and sugar in the lukewarm water and let sit for 5-10 minutes until frothy. Add the yeast mixture along with the buttermilk and beer. Knead on the bread setting (#2) for 10 minutes. Scoop the mixture into a non-reactive bowl, cover loosely with plastic wrap and let it sit at room temperature for at least 8 hours, preferably longer, up to 24 hours (the longer the better for the whole grain berries to soften and for heightened sourdough properties). 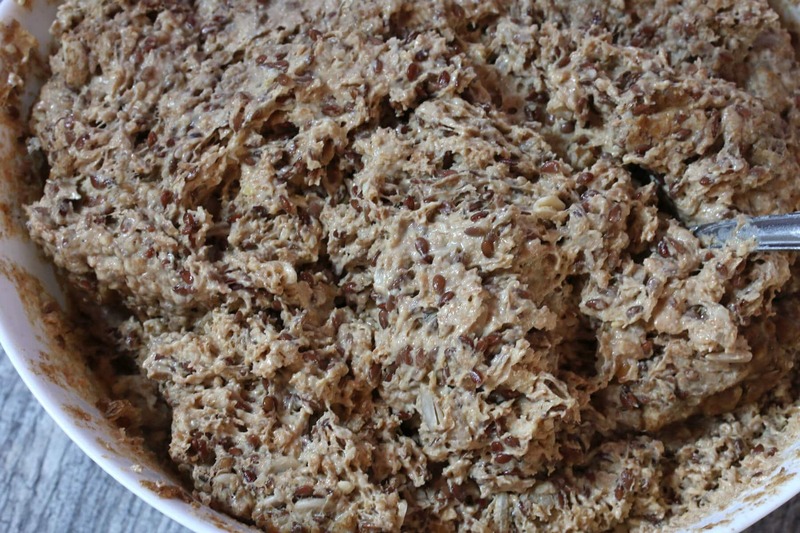 Also the longer it ferments the more liquid will be absorbed so less chances of a moist center after baking. The mixture will be thick and gooey but will not resemble typical bread dough. Scoop the mixture into a generously buttered Pullman Loaf Pan and smooth the top so it’s even. 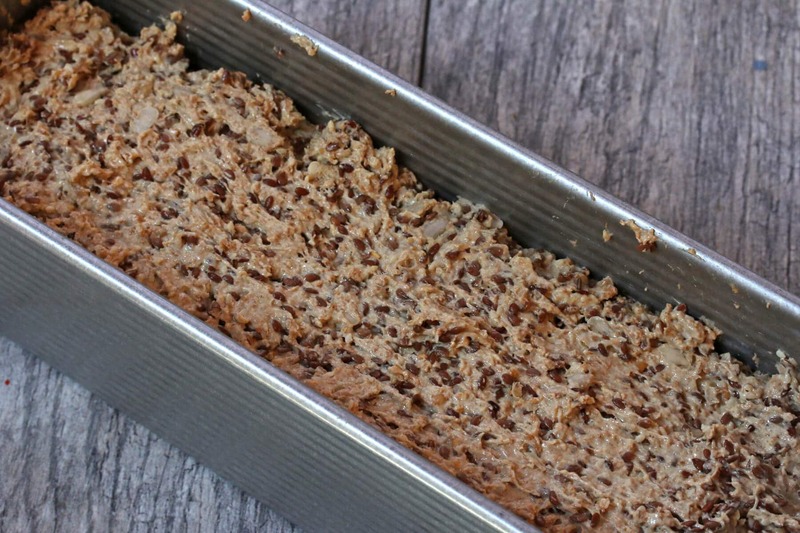 Baking this bread in a Pullman loaf pan yields those nice small, square slices of bread. But it also helps ensure that the center of the bread is fully cooked. Plus, when I’m making other breads that rise a lot, the Pullman has a top on it that slides shut to keep the bread compact (this Einkornbrot doesn’t rise a lot during baking so I don’t bother putting the lid on for it). It’s also the loaf pan that is used to make the famous French pain de mie bread. I like to use it for a lot of my heartier European style breads. Sprinkle the top with rolled oats. In an oven preheated to 350 degrees F, bake it on the middle rack for 100-120 minutes or until the center is done. For best and most accurate results, use an instant read thermometer and aim for an internal temperature of about 205 degrees F.
Let is sit in the pan for 5 minutes before removing it, then let it cool completely on a wire rack before slicing it. We have a decades-old Hobart commercial slicer that we picked up on Craigslist years ago. I used to be the manager of a delicatessen in England and Hobart is the gold standard in food slicers. In fact, the very same model that we have is on display at the Smithsonian! I realize we got lucky and most of you aren’t going to find a good-priced Hobart on Craigslist, but there are other good slicers on the market that are vastly cheaper and do the job. Chef’s Choice Slicers are consistently ranked at the top. I haven’t personally tried one, but they get excellent reviews. Having a good slicer to get clean, thin slices of bread that look like something you bought at a professional bakery is really nice. Plus, whenever I find chunks of cooked ham, turkey or cheese on sale I get those and slice them myself – it’s much cheaper than buying them at the deli. At the very least you’ll need an excellent bread knife and for that my favorite knife, hands down, is the Cutco 9 3/4″ Slicer. It glides smoothly through bread and meat like no other. 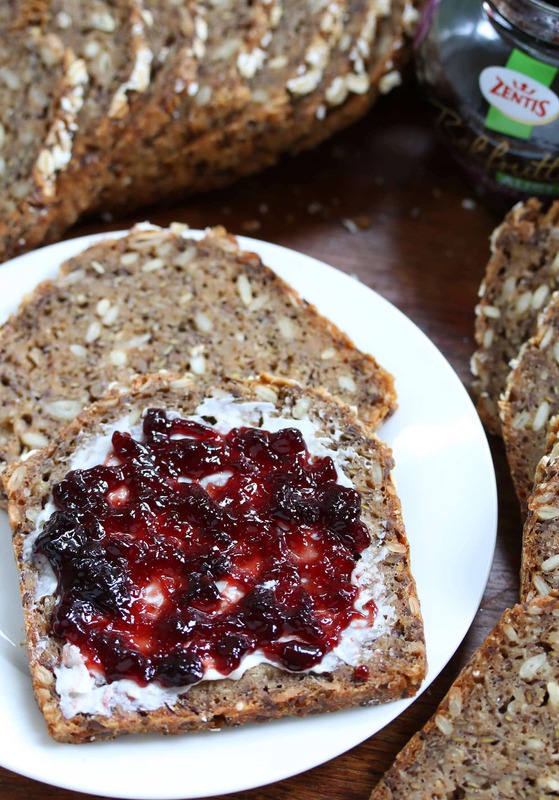 Experience the flavor and texture of Vollkornbrot like fresh from the German bakery! Combine all of the dry ingredients in the bowl of a stand mixer. (You can do this by hand if you prefer.) Then add the yeast mixture along with the buttermilk and beer. Attach the dough hook and knead on the bread setting (#2) for 10 minutes. Scoop the batter into a large non-reactive bowl, cover loosely with plastic wrap, and let it sit at room temperature for at least 8 hours, preferably longer, up to 24 hours (the longer the better for the whole grain berries to soften and for heightened sourdough properties). Also the longer it ferments the more liquid will be absorbed so less chances of a moist center after baking. Bake on the middle rack for 100-120 minutes or until the center is done. 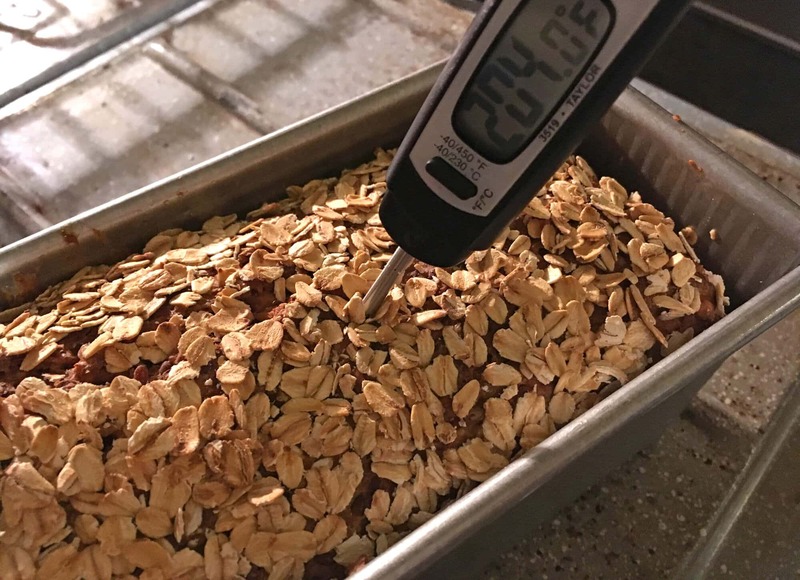 For best and most accurate results use an instant read thermometerand aim for about 205 degrees F. Let the bread sit in the pan for 5 minutes before removing it, then let it cool completely on a wire rack before slicing it. To get clean, professional slices I highly recommend using a bread slicer. What an absolutely gorgeous loaf of bread. One day I hope to have a mill so that I can grind my own grains. What a valuable and great recipe for get the real traditional german bread. love it! 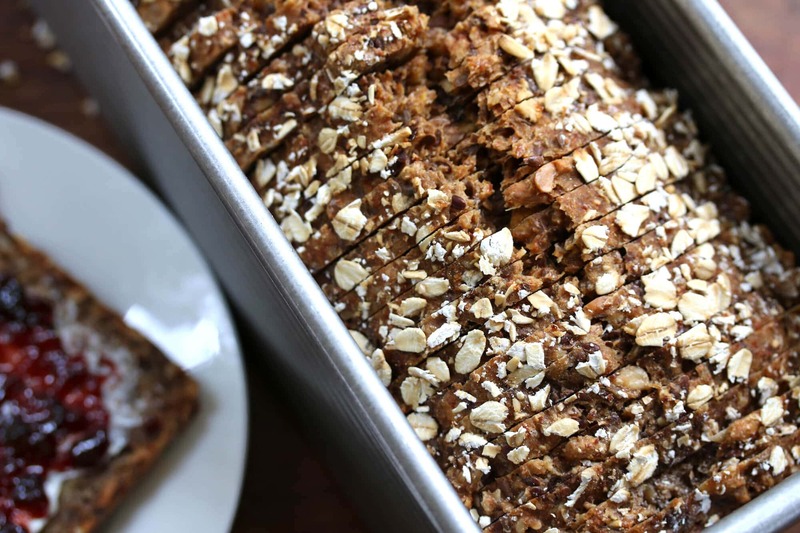 I love einkorn flour and this looks delicious! Oooh! My husband sure would love if I made this. You know what’s crazy – there’s all of 1 store in Berlin that carries einkorn! At least that was true when I was writing the cookbook in 2014. We called everywhere. And at the time, there were only 1 or 2 places to order it online. I just checked again and availability looks much better. Yay! I learned something new today and it was all about Einkorn. I also really liked your bread mold, slicer AND I loved that wheat grinder. I’ll have to get one one day. this is very similar to the bread I get at our local German bakery. thanks for sharing the recipe. I haven’t heard of this bread before, but my goodness, it looks amazing – would be perfect for breakfast! Looks so packed full of all the good stuff! I want to try this asap! What a hearty bread! I love using the bread machine! There is nothing better than homemade bread and this truly looks amazing! I have heard of einkorn before but I have never seen it here. I’ll continue to be on the lookout! Wow, I’ve never heard of Einkorn! I’ve got to find that! I bet my husband would love that! Ps. Love that grinder! What a fabulous bread! Love the texture! I’d never heard of einkorn before, but it looks like a great substitute for traditional wheat! The bread looks lovely. I absolutely love this type of hearty bread….this is perfection! I love the way all the grains look when they are together in the bowl! And when it’s complete it is perfect! I love homemade bread! I’ve never had this before, but it sure looks amazing! 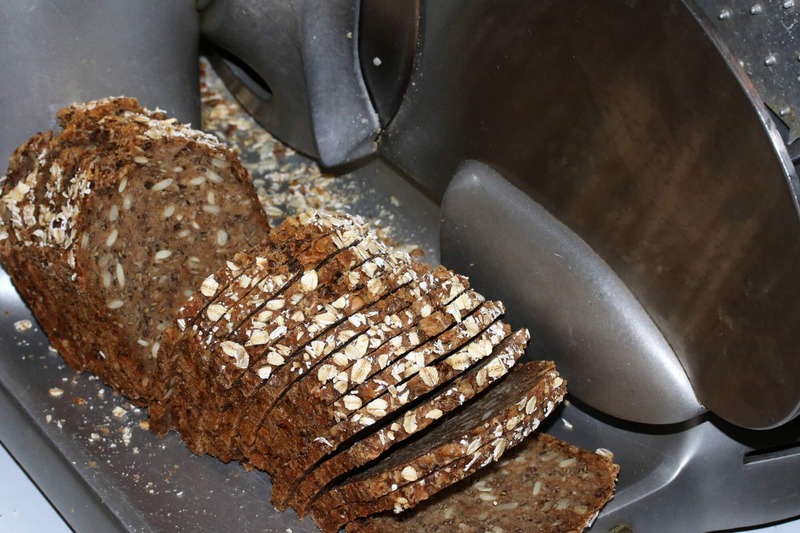 This bread looks really delicious….I love ALL THOSE GRAINS! That looks a wonderfully tasty loaf. Wonderful baking!I’ll have to try that one. This bread is so beautiful! I love thick, grainy bread so this is right up my alley! What a gorgeous loaf of bread. How wonderful that you grind your grains, that’s something I would love to do. Thank you for sharing this recipe, it looks and sounds so good! Oh wowwww! This bread looks super fantastic! Perfect looking Vollkornbrot. And super info about Einkorn, I have heard about it but never bought it myself, it is not quite so easily available here either, at least I have never seen it… I have to check by Tegut, they sometimes have more ausgefallene Sachen. Looks beautiful. I grew up in Germany but left when I was 18. I never cook German food but I still love Vollkornbrot and get it at my local Lidl or Aldi where I live in Spain. You might want to find out about Quark if you haven’t already. I use it instead of butter and spread any jam over it. Thanks, Sigrid. Yes, I am very familiar with Quark and since moving to the U.S. eleven years ago have never been able to find it so I have to make my own. 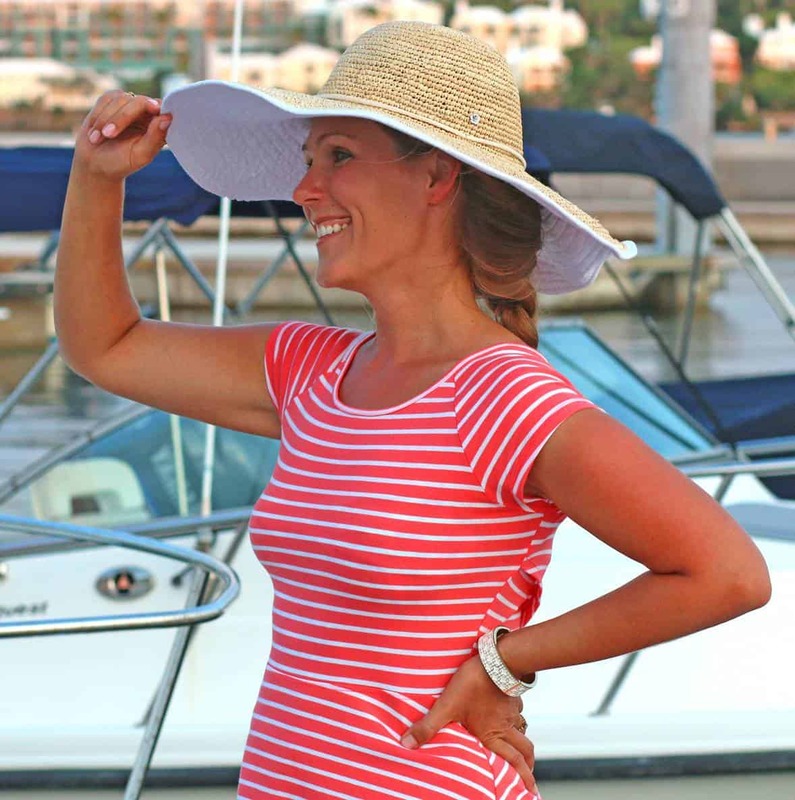 By the way, we just got back two weeks ago from a vacation to Spain – can’t wait to go back! Hi Kimberley, what’s the Stuttgart/Peterborough connection? I lived in California for 20 years with my deceased husband. Where did you to in Spain? We’re having a heat wave already. It reached 40 degrees C today and at 8 o#clock in the morning it was 30. I live east of Malaga. Hi Sigrid, I’m from Stuttgart and also lived in England for 7 years near Peterborough. Then moved to the U.S. eleven years ago. When we were in Spain we rented a car and covered 3000 miles, over 4800 kilometers :) We saw many, many places and cities throughout north, east, south, west and central Spain. We also visited Lisbon, Portugal. I’ll be publishing a series of travel posts covering the places we visited. We love Spain and had a wonderful time there. Hi Eileen, thanks for catching that. Yes, give it a generous buttering before adding the batter. Wonderful! I’m so glad you’re enjoying it, Eileen, and appreciate the feedback. I agree, I love the Pullman pan, too – the small squares are the perfect size. Your recipe calls for “cracked einkorn berries”. I ordered the flour and the whole berries, but I did not see cracked berries that you can purchase. So how do you crack them? I tried putting them in my food processor, but it doesn’t seem to be working. Hi Lisa! I’ve used both my grain mill and my Vitamix to coarsely crack grains. I would think a good food processor would work, too. If not do you have a powerful blender you can try? I went ahead and kept on processing them in my food processor until some of them cracked, but it didn’t seem to work all that well. However, I made the bread with them and it turned out great! I actually love the texture that it has. Thanks for responding! That’s terrific, Lisa, I’m so glad you enjoyed it and appreciate the feedback – thank you! That is so far the best and better described recipe for one of my favorite breads!! Thank you a lot for sharing. I have tested it, but since I did not have the berries or the cracked berries I ended up compensating by using more flour, so that in the end I had a ratio of 1.3 of flour to liquids. The end result was amazing, but there is a slight bitterness, which I am not sure why. Do you have any suggestion on how to adjust the recipe when not having the whole/cracked berries? Thank you, Antonio, I’m so pleased you were happy with the results! I haven’t made this without the whole and cracked berries so I can’t offer any recommendations for substitutes but it sounds like you already did so with great success. There’s nothing in the ingredients that would impart a bitter flavor so the only thing I can think of is the sourdough flavor – the longer you let the dough sit/ferment, the more of that sourdough flavor you’ll get. If the flavor bothers you can try and remove some of the edge by either adding a little honey to the dough or just not letting the dough ferment for as long. Thank you for your reply! I let the dough rest for about 11 hours, maybe room temperature in Arizona would made the resting time shorter? Anyways, I’ll keep playing around with the recipes. Thanks again for the recommendations, this website is already in my favorites :). Machs Gut, Tschüss! Made this today. Thank you for the straightforward recipe, other recipes for vollkornbrot seem very complicated in comparison. I needed to substitute flour and seeds but my little “overflow” loaf tasted great. I’ll give the big loaf plenty of time to cool. I’d like to veganise this for some family members, do you have any thoughts on a substitute for the buttermilk? Just more beer and/or water? Will also try to get einkorn for the next loaf. Thanks again! Hi Dorothy, I’m so pleased you enjoyed it and appreciate the feedback – thank you! Yes, I’d just substitute maybe a combination of beer/water for the buttermilk. Hello Kimberly, thank you for such a great recipe. Want to try it as soon as possible! One question, other recipes I checked before ask for the seeds and whole berries to get soaked in water for some hours before mixing the ingredients but yours say just to mix everything without doing so. Have you ever tried to bake this bread using soak? If so, what differences did you find? Which option is the one you liked most? Hi Guillermo, I don’t pre-soak them in this recipe because I usually let them soak with the rest of the batter for 24 hours. Whichever route you go, let us know how it turns out! Definitely going to try this. Thank you, Kimberly. As usual, you have given me another one of your great recipes to attempt. I have the slicer and the USA Pan Pullman pan…. Going online now to see about the grinder and the bulk flour/grains you’ve suggested. Have you tried L’Epicerie website for flour? I order their T-65 for my authentic French baguettes instead of the T-55 (German type 550) now. LOL… I just found an older Pullman pan in the back of the closet that I picked up many moons ago at E.Dehillerin’s. Thank you again for your post, I really enjoy them. P.S., What flavour of Zentis is that? Waldfrucht, johannisbeere or heidelbeere marmaladen/konfituren? Hi Joel! I haven’t tried the flours from L’Epicerie but they have a really nice selection. What I’ve been doing more and more is just experimenting on my own with my KoMo grain mill. I love the spectrum of ultra coarse to ultra fine and how easy it is to adjust the settings. Since getting my KoMo I hardly ever buy flour anymore. 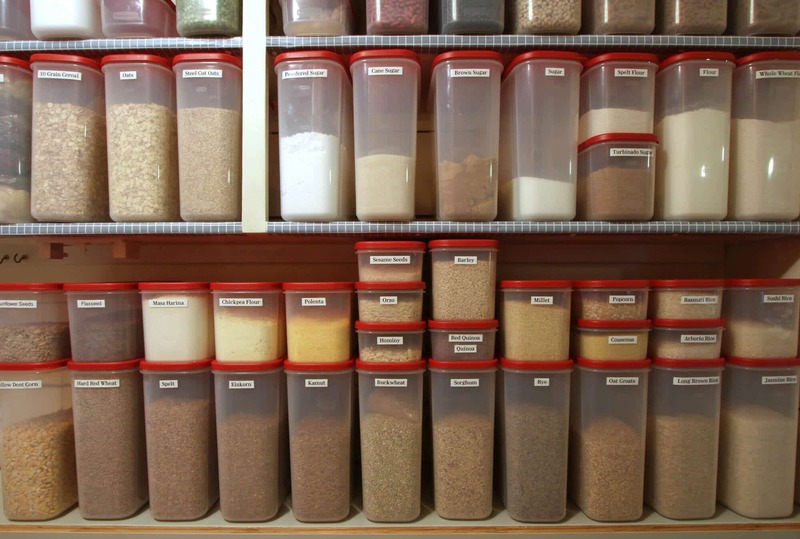 My pantry is stocked with dozens of different whole grains that I grind into flour myself whenever I need it. What I should do though is buy some T-65 (thanks for the suggestion) as a point of reference so I can work on getting my own ground version just right. Much cheaper that way and I also just love being able to grind my own flour fresh. E.Dehillerin – I’ll bet you picked up some other treasures as well? The Zentis jam – I think it was Schwarzer Kirsch. Do you cook the whole grain berries before adding. I am thinking that it would be too hard to chew, if they were not cooked. No, no cooking necessary. By the time the wet bread batter has sat for several hours and then baked the berries will be softened. Hi Rene, can you elaborate on what you mean by “wet”? This type of bread is not like the spongy dry stuff; it’s supposed to be dense and somewhat moist. So I’m trying to determine if what you mean by wet is the dense/moist consistency it’s supposed to have. Thanks for your reply. The first time the inside was raw. The second time I used less liquid overall. I live in Hawaii so I thought the humidity got to it. I now measured the inside temperature with a probe. It reached 199°F so I thought excellent but upon slicing it I found I be way too moist still. I understand it’s not a fluffy bread but it can’t even be cut properly.. I just don’t know what I am doing wrong.. I noticed somebody (you?) posted the same recipe under Danish Rugbrod with rye flour. Here it measure 4 1/2 cups but the rogbrod only gets 3 1/4 cups. Could either recipe be off? Hi Rene, no the ratio of wet to dry ingredients is very similar between the two breads and I’ve gotten great feedback about both from readers who have made them. I’ve also made them both several times myself, so I’m confident that the ratios are correct. The only thing I can think of is perhaps it has something to do with the bread pan you’re using. 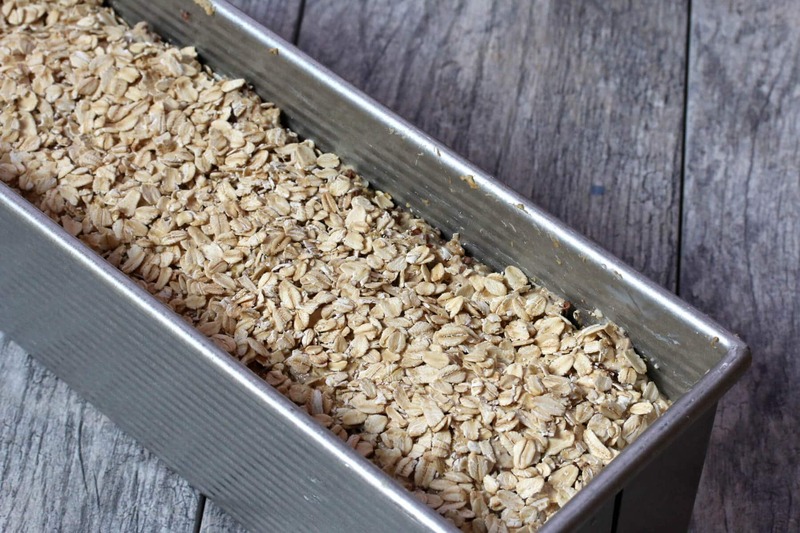 Are you using the long, narrow Pullman loaf pan or are you using something different? Standard bread pans are wider and that would explain why the center of the bread isn’t fully cooked. I have to admit, I did not think it would make a big difference which loaf pan I use. I only have a generic one from Safeway but I already thought it may have something to do with the density in the form. So, for this bread you use Pullman but for the other you use the Magic? Or would they both work in either? Yes, for this one I use the Pullman pan because it’s a larger quantity of dough. Because the Pullman is a skinnier/narrower loaf pan, the heat from the oven is able to penetrate and properly cook the center of the bread. That is the likely culprit here in your raw-centered bread – too much dough in too small of a pan. I’m impressed by your determination, Rene! I’m sorry the bread has failed you three times, but I’ve got my fingers crossed that my theory about the loaf pan is correct. Yes, please let us know how it goes the next time with the Pullman pan! Thanks again for the recipe. It’s already a huge hit around here ;) I also bought the Magic loaf pan and I will next try the Danish Rugbrød. Will let you know! I purchased a pullman pan (what a difference it made) I did soak the whole berries over night and let the batter sit for 6 hours before baking. I used 1/3 each of rye and red spring wheat berries (whole), next time will try to grind the wheat berries a little. I also put molasses instead of sugar. It turned out very good. But, it was moist. How long do you wait before putting them in bags for the freezer. Thank you so much for sharing. I bet that you didn’t expect to have so many questions, when you posted the recipe!! Wonderful, Judith, I’m glad you enjoyed it, thank you! Questions are always welcome :) I usually pre-slice the bread before freezing it, that way I can just take out however many slices I need at a time. I haven’t had the problem with it being moist though. I guess in the case of this particular batch I would slice it and let the slices sit single-layer on the counter for a while to dry a bit and then freeze it. If it’s still a little moist I’d recommend putting a little piece of parchment paper between each slice to prevent them from freezing together – that way you can easily remove a slice or two at a time. I had a similar problem when I made this recipe. The middle was raw even when I tried to cook it 30 minutes longer. I used regular loaf pans too. Is the Pullman loaf pan a requirement for this recipe? Are the einkorn berries cookies or dry? This bread looks so delicious I really want a loaf to come out. Thanks! Hi Misha, yes, the Pullman is a must because it’s long and skinny and the heat can penetrate it more fully and evenly. It’s either that or you could try dividing the dough between two smaller loaf pans. 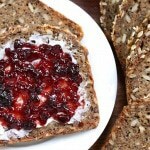 The einkorn berries are dry, not pre-cooked (you can also use regular wheat berries). I know it’s a pain to have to buy the extra Pullman loaf pan, but if you can swing it I really recommend it – you’ll also really love the shape and size of the slices! Just made this and it looks great except it did not rise and split down the center. I’ll have to wait to slice into it tomorrow since it is still too warm. Hopefully it tastes as good as it looks! BTW I used a Wilton 16″x4.5″x3.5″ loaf pan that I got at Michael’s today for $12. It’s a dark pan so I had to adjust the temp by dropping it to 325F. My husband is German so well see what he thinks! G’night! Hi Debbie, mine will sometimes get a shallow crevice along the top too. What did you think once you tried it? My husband is German and we travel every year to Deutschland to visit his family. I love the bread at the bakeries and always say I am going to take an empty suitcase and just bring back bread. Ha Ha. I found your site on a whim…searching for the special Einkorn flour from a recommendation from a coworker. I tried your recipe to the T…last night. I liked it very much – my husband says it needs darker flour. Having that said – next time I would like to try Rye or Wheat. Do you just substitute if for the Einkorn flour or should you use one part Wheat to two parts Rye or visa versa? Your pictures look like you use darker flour. Let me know. If I get better…I will purchase the long pan too!! PS I dreamt of your bread all night while it was raising. I couldn’t wait to put in the oven. This recipe and your site are wonderful!! Wonderful, Debby, I’m so glad you enjoyed it, thank you! For the pictures I took for this post I used 100% einkorn flour but I regularly use rye as well (yes, rye will create a darker loaf). I grind my own flour from whole berries, so maybe that impacted the color my einkorn bread differently, I’m not sure. But yes, you can use rye or wheat in any combination you like. Absolutely WONDERFUL bread! <3 I followed the directions as written and it came out perfect. The texture and flavor are exactly as I remember from the years I lived in Germany. Thank you!! Fantastic, Cathy, I am so thrilled to hear that, thank you! Hello, this bread looks wonderful! I am just confirming that the rye berries are go in as is? No soaking or sprouting, or any par-cooking? Thanks, Millie! Correct, they go in as they are, nothing needs to be done with them first. Hi Nicolette, the beer contributes yeast, bubbles/carbonation and flavor to the batter. You can omit though and just substitute water in its place. Kimberly, my husband almost dropped his coffee when he saw a picture i sent him of this bread. Thank you so much for sharing!!! Have you worked out the cost per loaf on this recipe? No, I haven’t. Cost is going to vary depending on where you get your grains. For example, I also use organic, non-gmo grains and they’re pricier. Does the whole flaxseed shell or coat breakdown in the whole process? I’ve understood that flaxseed needs to be ground in order to get the nutrition of the seed i.e. that normal digestion will not breakdown the the coat. Hi Bill, no, it doesn’t break down. 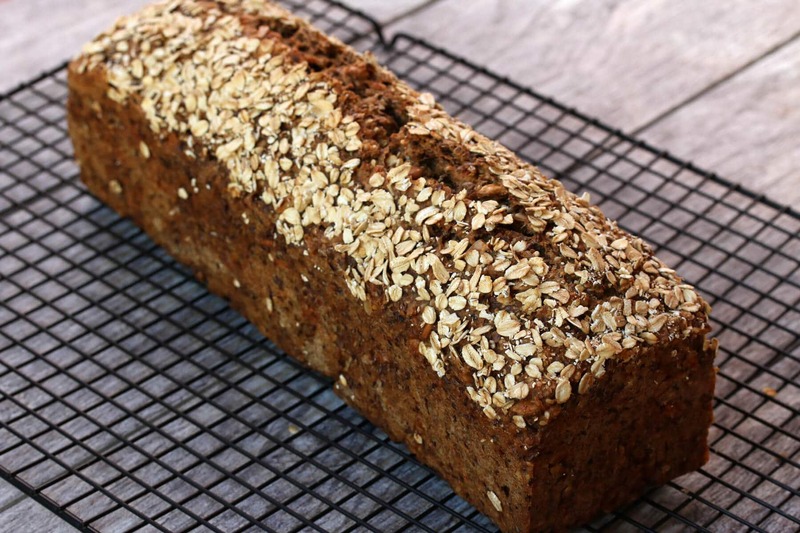 Whole flaxseeds in bread provide bulk, texture and a great source of insoluble fiber. This is THE BEST vollkornbrot I’ve had since I left Germany over 20 years ago! It’s exactly like I remember it, maybe even better. I’ll be making this again and again. Thank you so very, very much! Fantastic, Candace, I’m so glad you enjoyed it, thank you! 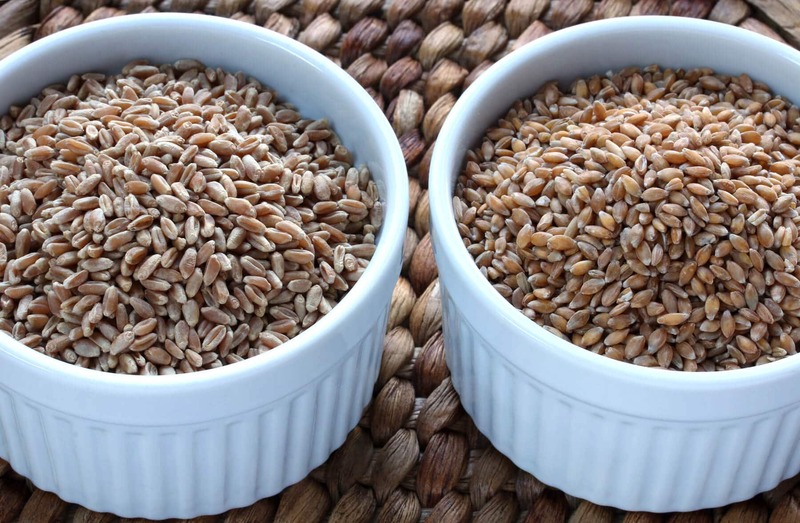 Frage bezueglich Rye und Spelt Mehl sollte man kein Einkorn Mehl haendlich haben. Ist halb und halb ein guter Ratio oder mehr Spelt wie Rye? (2/3 & 1/3)? Natuerlich muss ich gleich Einkorn bestllen. Hi Ilona, the beer and buttermilk both contribute to the flavor and texture, but using water only should certainly work. If I used sourdough starter instead of yeast would it be okay to omit the milk and beer? Beer isn’t allowed in the house and I’m not a fan of buttermilk so that’s the only reason I ask. But I don’t know enough about how to make this kind of bread to make that big of an adjustment, so I’d really like to know if you think it would work okay or if i should just use more water. Sorry for all the questions, and thanks for replying so quickly, I would love to make your bread!!! Unless you have a dairy allergy I would leave the buttermilk. Don’t worry about the flavor of the buttermilk, you won’t be able to taste it in the bread. The beer you can omit. 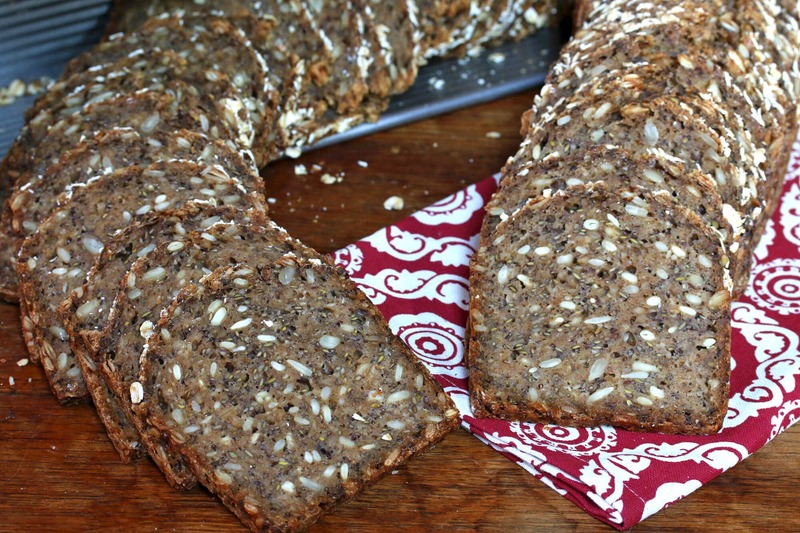 We love this Volkornbrot recipe. Strange at first with the wetter dough, but now I am used to it and can now even see when the gluten is activated. I have made it with einkorn,bronze chief and spelt berries. The spelt was excellent. I am also going to try prairie gold berries,my favorite wheat for other bread. I use two stoneware bread pans for the recipe and it works perfectly. I substitute water for the beer, but use the buttermilk.My husband loves this bread for his sandwiches for his packed lunch. Coming from South Africa, we love the wholewheat breads. I have tried all kinds of things to get the whole wheat bread just right. Never thought to just leave some berries whole! Thank you for sharing the recipe! Fantastic, Louise, I’m so glad you both love this bread as much as we do – thanks so much for the feedback! I’M IN HEAVEN!!! I haven’t had bread this good since I was in Germany. I was intimidated at first to make this, though I do have some bread-baking experience, but your pictured tutorial made it easy to follow along each step of the way and in the end I pulled out a perfect loaf of vollkornbrot that I’m now savoring to the last crumb. I’ll be making this bread again and again. Wonderful, Tim, I’m so thrilled to hear that, thank you! your bread looks sooo good! do you think cashew milk would be a suitable replacement for buttermilk for your vegan followers? Hi Teresa, yes that should work just fine. Happy baking! My daughter brought me some sourdough starter. I am wondering if I can use this in this bread instead of the active yeast? when and how do I add it? and would I need to let it sit for so long then? I have made this recipe numerous time – it is delicious but I find if I leave it too long it is a bit too sour for me, so don’t leave it as long and it is perfect. Hi Judith, I’m so glad you’ve made this several times and love it as much as we do – thank you! Yes, as long as the starter is plenty strong and active you can use it in place of the dried yeast. Without having tried it myself though I hesitate to guess on how much to use and how to alter the other ratios. If you give it a try please let us know how it turns out! Hi Judith. I’ve been wondering about sourdough swap as well. How did it work for you? Hi, I have not tried it for fear I would waste all those great ingredients if it doesn’t work. I have been trying whole wheat sourdough recipes – but still have not been successful – so am going to keep on trying and once I can successfully make some good sourdough – then will try to incorporate the volkornbrot ingredients. Sounds like we’re in the same boat – both on the WW sourdough account and fear of wasted ingredients. I’ll let you know if I do give it a go and it works. Hi Samantha, correct, the consistency is not like traditional dough but more like a batter. It will thicken a bit more as it sits for the instructed amount of time but it will still be a thick batter. Let us know how it turns out! Thanks, about to bake it! Would two standard bread pans work? I don’t have the one you recommend. Two may be slightly too much, you’ll probably end up with one that’s full and another that’s not quite full. I used 2 bread pans and it turned out quite well- 2 Pampered Chef stoneware bread pans, in which I bake all my loaves. Perfect, Louise, thanks for sharing! is dry active yeast the same as instant yeast, and if so, how do the quantities compare? 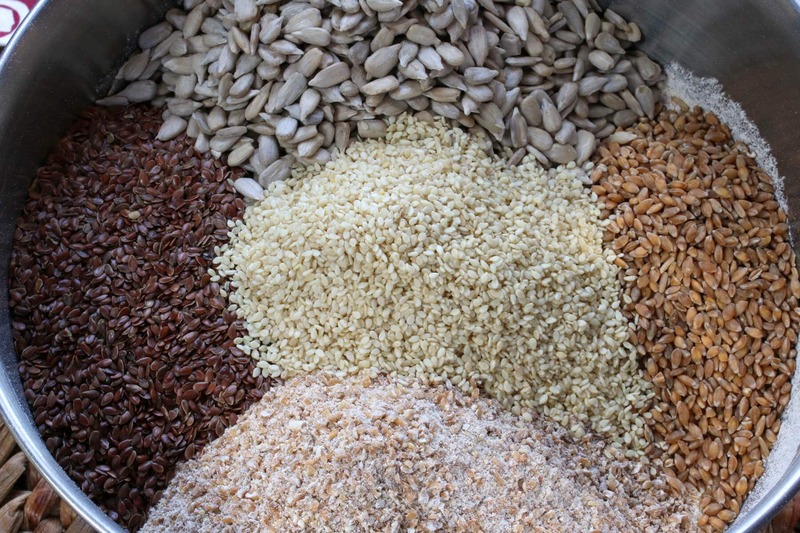 is there any advantage in soaking the grains first? Hi Sybille! Yes, they are the same thing so you will use the same quantity. There is no need to soak the grains, they will soften as the batter sits/ferments and while the bread is baking and they will be plenty soft. Plus soaking the grains will result in a wetter batter and that may negatively impact the final outcome. YES, homemade Quark is the way to go! I am so excited to try this bread! I used to live in Finland and we ate a type like this quite often, but it is impossible to find here. I had not even thought about the idea of making it on my own until I found your recipe. Thank you!! Wonderful, Bethany, I hope you enjoy it, please let us know what you think! Wonderful recipe with very complete instructions. Couldn’t find the average number of slices per loaf? Trying to get nutritional value per slice. Thank you so much for posting this recipe!!! I was born in Germany and don’t like how limited my access to good bread here is in the states. I want to start making this for my family since I want my kids to grow up eating “real” bread in my opinion. ;) I was curious if you could give me an idea of what kind of beer you tend to use or what is considered “mild.” I have been making our own bread, but wasn’t thrilled with my current recipe. I can’t wait for my new ingredients to come in to make a big batch of this. Also, does this bread freeze well? I normally make a loaf, slice, and freeze half so we don’t feel rushed to eat it all. Thank you again!! Hi JWarfield! For the beer I just buy whatever is on sale :) Look for a beer that is light in color and you’ll be good to go. Yes, this does freeze well. For convenience I like to pre-slice the loaf and then freeze the slices a few at a time between waxed paper, that way I can grab a small stack at a time, let the slices thaw and they’re ready to eat. Thank you so much for posting this! I just followed your link to the loaf pan. And if I order more of your recommendations I’ll follow your links. :) My mother was born and raised in Germany and I grew up eating her fresh baked bread. I baked bread when my children were smaller too, but haven’t in a while. Last night my husband and I had some Dreikornbrot at a restaurant (in the US) and it was delicious!!! So today I’m searching for a recipe. I don’t have a bread mixer so I’m wondering how long to knead the bread by hand? Same 10 minutes? Thank you! Wonderful, JBreckwoldt! Yes, 10 minutes of stirring by hand will be sufficient. Happy baking and please let us know what you think once you’ve tried it! Great recipe. I was able to adapt this to sourdough with no problem. 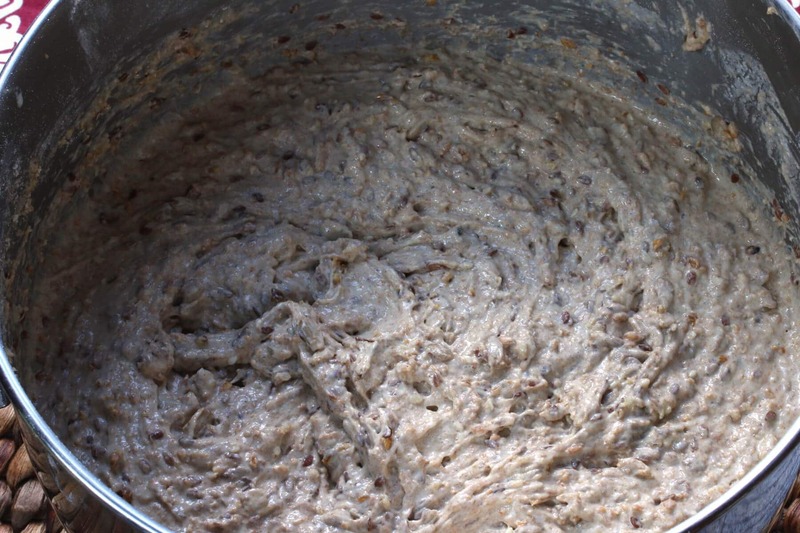 I made an einkorn starter(3 straight days of feeding a regular starter with whole einkorn). I used 250 gm of leaven (150 Einkorn flour/100 gm H20). Then I just subtracted those amounts from the flour and water portions respectively. I let the dough ferment the full 24 hours. I also used Kefir rather than buttermilk as that was all I could find. The best part is how easy this is to make. Having never made any Volkenbrot style bread before, the dough was amazingly wet (more like batter) but it came out perfectly. I used a thermometer which was key, without that I thought it was done at 110 minutes, but it actually needed 125. Really good with cream cheese, nova salmon and red onion! Of course good with good butter and jam too. The texture allows good thin slicing with a good bread knife. Fantastic, Wouter, I’m so glad you enjoyed it, thank you! Thank you also for the insight on adapting it to sourdough. I made the batter/dough last night and let it rise for about 19 hours. I used 1:1 Einkorn to rye flour. In place of the cracked einkorn, I used whole rye berries. I used tve recommended 13x4x4 Pullman. My thermometer read 202.5 after more than 3 hours. I thought that there might have been an issue with the thermometer, because it had baked nearly double the time.. Luckily, I was impatient and didn’t let it cool all the way before cutting into the bread. I discovered it was still raw, so I put it back in the oven and I’m hoping it will cook through. Do you think this has to do with using whole rye instead of cracked rye? Perhaps they needed more time to soak up the liquid before being baked? Thanks for your help. Hi Anastasia, yes, that’s my guess. The 1 3/4 cups are supposed to be cracked, which changes both the volume and the absorbability. It sounds like having used whole berries instead of cracked there was too much liquid left that never got properly absorbed. This bread looks divine! It looks like the bread of my youth, not the slightly grey, light brown nothing good in it loaf I find at the store. 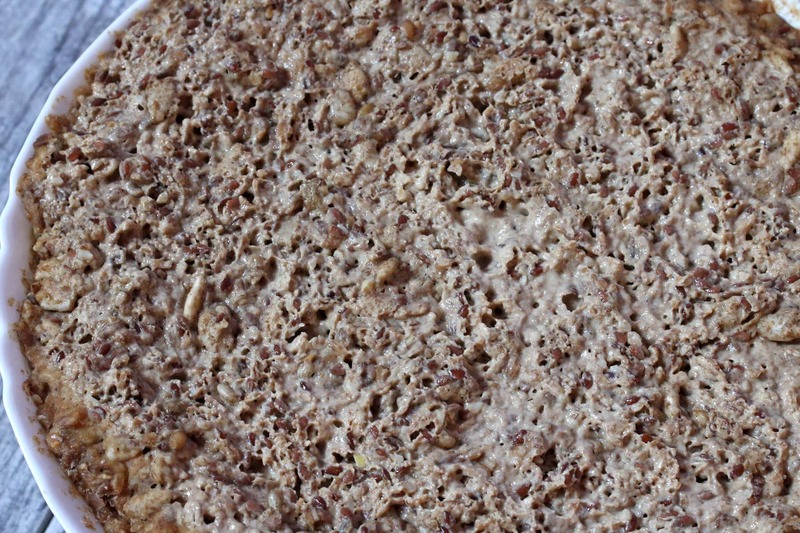 I had decided to start making my own bread…full of seeds and whole grains…organic! Your recipe is the first load I will make, so thank you so much for posting it!!! Fantastic, Cristabel, please let us know how it turns out! Just made this for the first time. Worked really well except that the uncracked spelt berries came out too hard, crunchy. Anyone else experience this? Suggestions? Hi Sam, how long did you let the batter ferment? Ideally it should be as close to 24 hours as possible – it not only increases the sourdough properties but ensures the berries are softened. Hi Maureen, I don’t. This lid is usually to keep the bread compressed and in a square shape as it rises but in the case of this particular kind of bread, it’s so heavy that it isn’t going to rise much anyway. The pictures you see in the blog post are of the bread baked without the lid on. It’s optional. ok thanks..looks good. smells amazing..
Hello! Thanks so much for your recipe and your explanation of Einkorn flour and gluten sensitivities. I learned a lot! Because I am diagnosed with Celiac Disease I would like to consider subbing out the Einkorn flour and berries with buckwheat and oats (rolled and/or steel cut). Any thoughts or experience with substitute ingredients? I’m OK with experimenting, but just thought I’d ask first. Thank you! Hi Lynn, I’ve subbed other grains in the wheat family (spelt, rye, regular wheat) but have not tried substituting gluten-free grains and so I don’t know how well it would work. If you try it let us know how it goes! As a complete novice at baking bread, this came out really well. I had to increase the baking time to 2 hours using a thermometer to test the internal temperature. My only holdback is the beer made the taste too strong for me and I like a sweeter bread. I know I can omit the beer and buttermilk by using water, but can I increase the sugar (I used agave nectar) without changing something else. Also, add additional seeds like pumpkin or more sunflower seeds. PS-I can’t wait to try your other recipes! Hi Barbara, I’m so glad it was a success! Yes, feel free to add sweetener and you don’t need to change anything else unless you’re using “a lot” of liquid sweetener, in which case you may need to add a little extra flour to compensate for the additional liquid (but again, only if you’re using quite a bit, which I doubt you are). Absolutely, add any other seeds you like. I baked this in hope of recreating some bread I get from a little shop in my town that’s delicious but very pricey. Just cut my first slice and the taste is very similar; nutty, dense and ever so slightly sour. Unfortunately it isn’t cooked all the way through. My fault, I don’t have a Pullman pan so I just used two small loaf pans. They were in for 2 1/2 hours and internal temp read 205 when I took them out but the middle is still a little wet despite a very crusty exterior. I’ll probably still eat it, just toasted, but wanted to leave a review to emphasize the importance of using the right size pan. Maybe next time I’ll reduce the temp and bake even longer? Not sure. I just know I don’t have room for another pan. I was so excited to try this out and it turned out perfect by following your instructions exactly! Its a beautiful loaf to look at and the best to eat with cream cheese and jam! I didn’t have beer so I substituted with Buttermilk as you suggested. I baked it to 205F which took 110 minutes – the crust turns out quite hard though. I’m ok with a hard crust however it may be a bit much for people with sensitive or false teeth. Any tips on how to make the crust softer? I’m so glad you enjoyed it, Christina, thank you! Yes, the crust is hard (the nature of the sourdough ferment) but if you store it in an airtight container it will soften up. This bread looks amazing and I cannot wait to try baking it. For a vegan option can I make the buttermilk by using almond milk with vinegar? Thanks, Joanna, and yes, you can substitute almond milk, no problem. Happy baking!